Sunday, June 05, 2016 by: Isabelle Z. (NaturalNews) It's every expectant mother's worst nightmare: successfully getting through nine months of pregnancy only to suffer a stillbirth at the end. Most pregnant women do everything possible to avoid putting their baby in harm's way, from making dietary changes to avoiding risky activities. However, few women give much thought to the quality of the air they breathe. Most of us take the air around us for granted, but it's something that deserves a much closer look when you're expecting. Danish researchers have discovered that there is a very strong link between air pollution, such as from car exhaust fumes, and stillbirths. 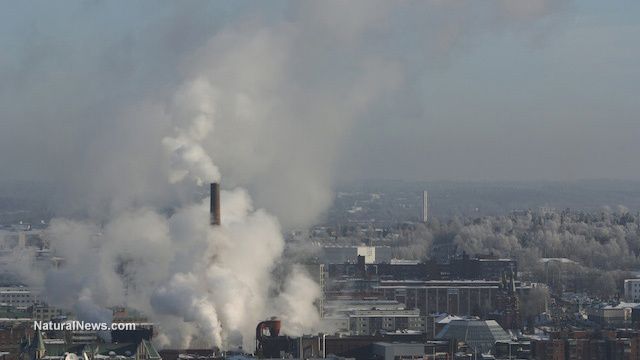 The University of Copenhagen team examined 13 studies to reach their conclusions, and they're calling on tougher regulations regarding industrial waste and vehicle fumes. In the meantime, they suggest that pregnant women move to areas with less pollution. The risks of a stillbirth caused by smog exposure are particularly high during the last trimester. In addition, they discovered that even small amounts of air pollution can cause the risk of stillbirth to jump significantly. When the air pollution concentration rose by just 4 micrograms per cubic meter, the stillbirth risk jumped by 4 percent. Their findings were published in the journal Occupational and Environmental Medicine. The study's lead author, Dr. Marie Pedersen, said: "Stillbirth is one of the most neglected tragedies in global health today, and the existing evidence summarised deserves additional investigation. If the evidence of an association between ambient air population and stillbirth is confirmed in future studies, it would be of major public health importance." Professor Jouni Jaakkola of Finland's University of Oulu, agrees, telling the Telegraph that advising pregnant women to move to greener areas is "wise advice." This connection is supported by data that shows UK stillbirth rates are as much as 40 percent higher in some postal codes than others. The University of Oulu's Nazeeba Siddika said: "Foetuses are more affected by a variety of environmental toxicants because of differential exposure and physiological immaturity. The biological mechanisms by which exposure to ambient air pollutants leads to foetal death is not very clear." Many stillbirths are linked to placental trouble, which might be caused by genetics or infection, but in many cases, the cause remains unexplained. Air pollution joins other lifestyle factors including obesity, advanced maternal age, smoking and alcohol consumption as boosting the risk of stillbirth. Scientists are calling for further research to better understand the exact mechanisms involved in this risk. Women who live in areas with high levels of air pollution, that give birth to healthy babies, are not out of the woods, either. A study from Columbia University and Chongqing Medical University found a link between air pollution and developmental problems in infants, starting in the womb. Maternal air pollution exposure has also been linked to lower IQs in children, cancer, lower birth weight, a smaller newborn head size, developmental delays and asthma. The WHO estimates that around 7 million people die each year as a result of poor air quality, making it the biggest environmental risk factor for death and diseases. This new information about the risk of stillbirth makes the problem even more pressing. With 18.4 stillbirths for every 1,000 total births around the world noted in 2015, pregnant women should do everything they can to stack the odds in their favor, including avoiding polluted areas and sticking to organic food. It might not be feasible for everyone, but spending the last three months of pregnancy in the countryside could help give your baby a great start in life.